With their chic design, impressive lifespan and practical functions, modern LED luminaires can be found in more and more areas of the home. Following the announcement of additions to the LEDVANCE luminaire portfolio at Light+Building 2018 the new products from this leading lighting company have been available in retail outlets since August to provide the right light for indoors and outdoors. Panel luminaires with their modern minimalist design are popular throughout the home – in living rooms, dining rooms or bedrooms. For the “Planon” family of products LEDVANCE makes the most of the extremely low-profile designs that LEDs in particular have opened up. Since August, there has been a new addition to the Planon family in the form of the “Frameless” series in which the entire base serves as the light emitting surface. The new luminaires are available as simple on/off modules, as well as on-off modules with adjustable color temperature or RGB colored light. The stylish square Frameless LED modules have edge lengths of 300, 400 or 600 mm; the rectangular models have a length of 600 or 1,200 mm and various widths. All the Planon luminaires can be surface mounted; some can be used as pendant luminaires. LEDVANCE has also launched the “Orbis” family in August. The uniform light from these wall and ceiling luminaires creates a pleasant effect in any room. The LED luminaires previously marketed under the Silara name will be gradually integrated in the Orbis family. Some models, such as the “Orbis Square Sparkle” and the “Orbis Sparkle” provide a gentle glitter effect. 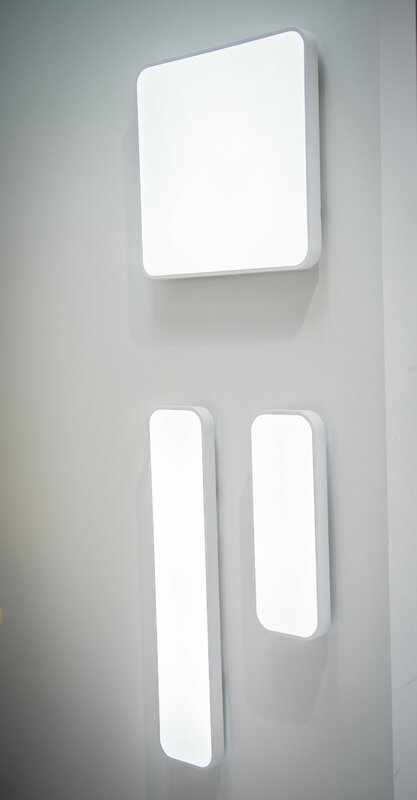 LEDVANCE has introduced the stylish “Panan” series of luminaires to bring LED light to desks. All the models offer warm white light at 3,000 K and are available in a variety of designs, colors and technical configurations to suit different tastes. The built-in battery in some of the models provides light for several hours so you have the flexibility to work away from a power supply. Other models in the “Panan” series can be switched on and off, dimmed and adjusted in light temperature via a touch sensor. The luminaires can be placed on a desk on their pedestal or can be clamped to the edge of the desk. The “Panan Speaker” is chic, minimalist and multifunctional. It has a speaker built into its pedestal and can be connected via either Bluetooth or a jack plug. The “Panan Alu USB” is the smart choice for people addicted to their smartphones or tablets because of its handy USB-A power socket at the back. The new undercupboard “Cabinet LED Panel” luminaires from LEDVANCE are ideal for the kitchen. These low-profile fixtures can be smoothly dimmed via an infrared sensor and provide uniform illumination for kitchen work surfaces. The new LED Spot Kits are another highlight with their mounting depth of only three centimeters. They can be dimmed from a large number of standard light switches. Simply double clicking on the switch will start the luminaire dimming; double clicking again will stop the process. The spotlights are housed in a high-quality metal casing and can be swiveled by as much as 20 degrees. Since August LEDVANCE offers DIY enthusiasts some seriously powerful indoor batten luminaires. These robust “LED Power Batten” models are available in two light colors and lengths and come with clips for simple installation on walls or ceilings above workbenches. For small jobs around the house the stand-mounted “LED Worklight” is ideal. These lightweight yet robust work lights are easy to carry and set up thanks to the handy quick-lock system. LEDVANCE has expanded its current Endura Style series for outdoor applications. The models that are particularly popular with customers are the ones with sensors, the “Up-and-Down” lights and versions in stainless steel. These luminaires feature integrated LED modules and daylight and motion sensors and provide warm white 3,000 K light. They are chic and robust and benefit from a five-year guarantee. The Solar family has also been expanded. In time for the new lighting system, the range includes pillar and pathway lights for the first time. They can be switched to operate on either line voltage or solar energy stored in the built-in rechargeable battery. Available since August, LEDVANCE has launched “Endura Classic”, a product group with an E27 base in which the light source can be freely combined with the luminaire to meet different user requirements – for example with decorative LED filament lamps or with “Smart+” lamps from LEDVANCE.